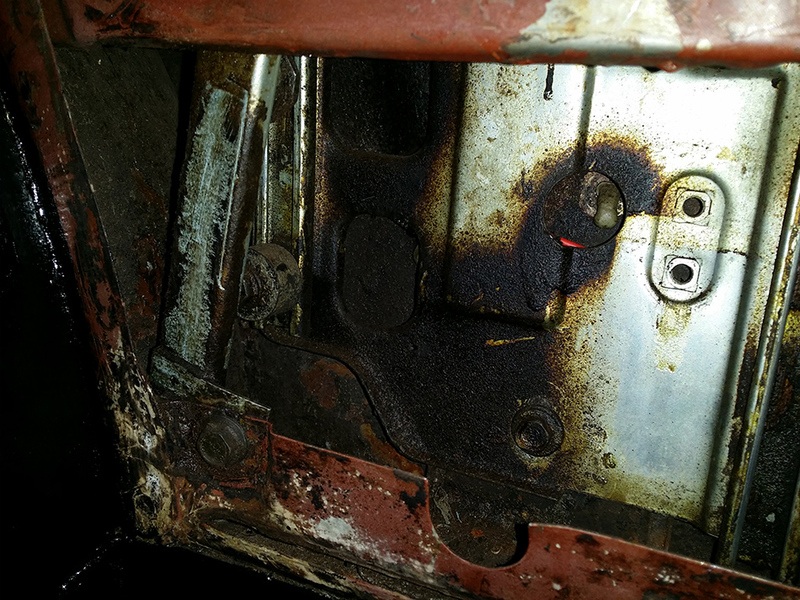 Obviously to rust treat inside the side panels by the seat the glass needed to come out. This would allow me to get to the insides of the quarter panels and also refurbish the winder mechanism as well as giving myself a head start when it comes to lining up the windows which are all over the place and do not fit very well to say the least. Ok, this was done without the manuals and still seamed to work fine. I soaked all the bolts I could see with a little Gibbs Brand to make it easier to remove them. 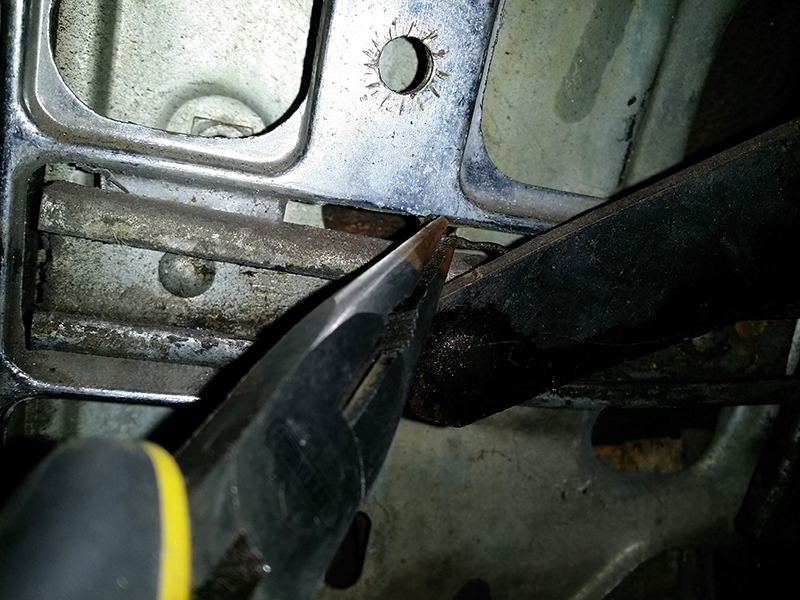 I always make sure I can undo all the bolts to some degree as there is nothing worse than the last bolt being a paint to remove as it’s seized in place. If you loosen all the bolts first then you know they will come out. It wasn’t to difficult but more of an awkward process to remove things out of the top for the window and at the bottom for the mechanism. All the parts, the window, frame and mechanism are attached to each other and has to come apart while inside the gap between the quarter panel skin and the inside side frame. The top of the window has some felt strip for the water and the rubber gaiter at the front to the door post. The rubber and the felt were not on my car, but they are held in place by a couple of screws. The side frame metal work has a number of half-inch bolts that hold the mechanism to the side frame and the glass to the rail frame in order to allow the movement up and down of the window. The glass needs to come out first as there is not enough room to remove the rail frame and the glass out of the top, I did try. 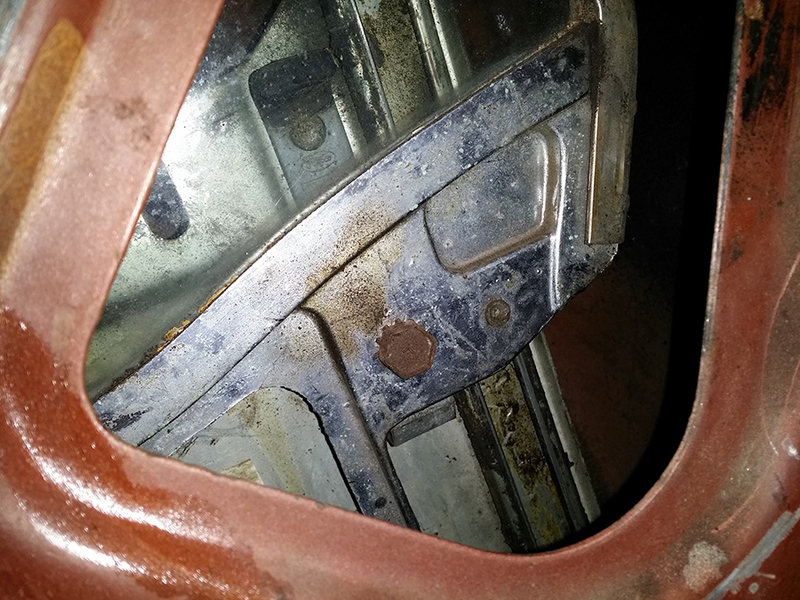 With the window wound up there is access to two bolts that hold the frame at the top and there is a single bolt at the bottom which is attached to an elbow bracket, there is also a bump stop held on by a single bolt next to it. Undo these bolts and remove them. Once this is undone the whole frame with the glass can be moved around. 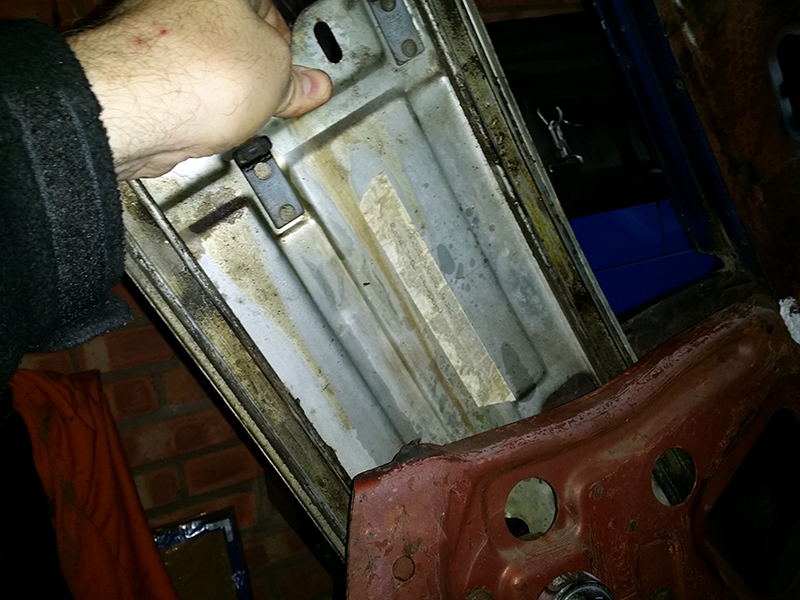 I wound the window down half way to undo the guide brackets to the window, once these are undone a metal bracket will be released from the back and will have to catch it. The brackets fit in recesses at the back and act as guides for the window. Once these are out-of-the-way the window is only held in place by a horizontal rail with the nylon runner in place. There is a crinkled pin that holds the nylon runner in place to the window that can be removed by a long nose pair of pliers. With the pin removed you now have enough room to move the frame away at the back and allow the mechanism pin that’s sits in the runner to be separated. The glass is fairly heavy and should be supported as much as possible to stop it cracking of braking etc. Now slide the nylon runner out of the rail so you don’t loss it. Once freed the glass can be removed out of the top of the rear quarter panel. The rear backing plate can now also be removed out of the top in the same way. The bottom clamp has two bolts to hold it to the bottom of the sill. Undo these to bolts and lift out the clamp. To remove the mechanism there is an angled bar that is bolted to the side frame and needs to be undone and the other end near the collection of the bolts around the window winder, the other end is on the bottom row of three slightly off to one side. Once the two bolts are undone the rail will slide of another nylon runner, remove the rail by sliding upwards and back out of the space at the bottom. The remaining bolts need to be released and removed, I held the spline for the window winder as the bolts were undone. Once the bots are out then the mechanism can be manoeuvred out of the gap at the bottom. Once the mechanism is out that is all the parts removed. Once the parts were all out I laid them out on the bench before they were cleaned and treated before being refitted. The principle is exactly the same but just flipped to the opposite side. There was one difference of a bump stop at the bottom in the track itself which I suspect is not standard. Why it’s there I have no idea but I have a photo of it. The way it was connected was with a valance bolt and fitting. onto a rubber grommet. The grommet looks like it has come from the steering ram mounting. It can be seen to the bottom left of the frame. The removal was exactly the same and so only a few pictures taken here but slightly different ones for different views. This was a nightmare, more so the left hand side than the right side. The reason was the fact that somebody had gone a bit mad with the Waxoyl and sprayed it everywhere un to a one millimetre thick. That doesn’t sound a lot but trust me it is. The winder would not work very well and was a so stiff I expected it to break if I wound it down. Both the sides had grease that had gone hard and filled with all sorts of rubbish in the tracks. The cleaning was done with scrapping off the old Waxoyl and then degreasing with Marine Clean, Gibbs Brand with lots & lots of elbow grease. This had to be clean, wipe down see where you are then start again. With the glass frame and window itself the chrome was cleaned down and polished with Autosol paste. The chrome was slightly pitted on the inside but cleaned up better on the outside. The priority for the windows after the chrome was to free up the nylon bushes that ride in the tracks. Both sides were seized solid and after a clean up and soak with Gibbs they released and now turn. The mechanism around the cog area were almost seized with the old dried grease that had to be picked out of each tooth. The left side also had to deal with the remains of some Waxoyl to be cleaned of and was on the gears. This took for ever and a a day, scrape, clean, degrease clean and again etc until it all came up clean. I gave each mechanism a coating of Gibbs to store for now but I will grease only when nearer the time otherwise the new grease will attract dirt and anything else such as fly landing on it etc. First couple of pics are of the mechanism uncleaned but the remaining are again cleaned up with a coating of Gibbs. These were simple, a rub down with a wire brush and then a coating of the Granville anti Rust. The Granville acted quickly and turned black within a few minutes. The brackets looked a lot worse than they were as only the surface was rusted a little and the rest was quite solid in fact. 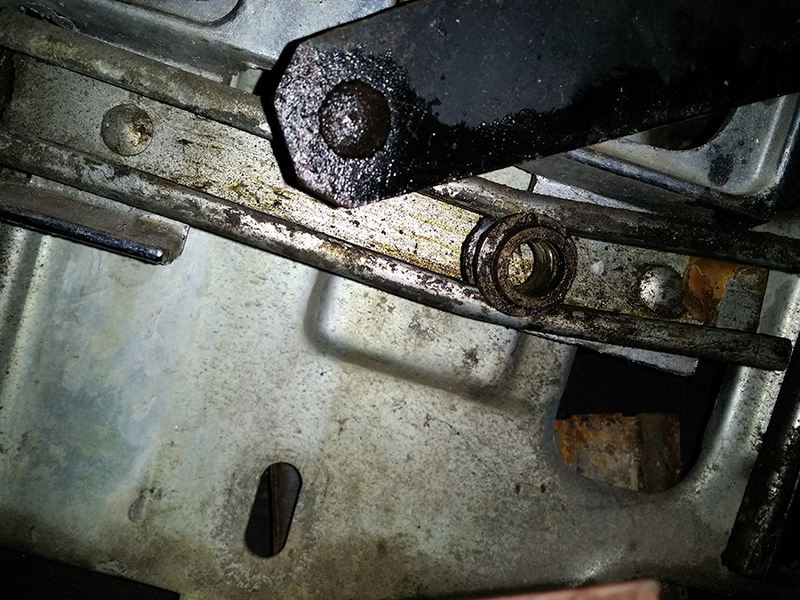 The bolt holders were again treated in the same way and fitted back in place once they were dry. In theory this should be a reverse process but I will not be able to prove that for a while as the car is being dismantled ready for spray and bodywork. Easy enough to remove and took about an hour or so each side. There are a couple of videos on you tube on how to do this, but they looked a little long winded to me. My method seems to work and the only problem is separating the glass from the frame and removing the glass from the top. Once you have done that the rest is quite easy. Thanks for posting this… Great detail and the photos makes this a great resource… Will l definitely help when I refurb mine! Thanks Glenn, a single comment like yours makes all the years and time writing about it worth while. I would love to keep up to date with your progress. Watch them knuckles and enjoy it all. I miss doing mine up now. Have been trying to repair one of my 65 s rear windows all day not running true , this will be a great help couldn’t work out how those mothers came out and limited wiggle room . Hi, Thanks for the comment, I’m glad it helped you. They are not the easiest of things to get right I must admit. Mart. where can I buy the Guides for the Quarter windows? I’m not sure where you are located, if you are in the UK I would would have to say try Mustang Maniac. https://mustangmaniac.co.uk They will ship to you. Try giving them an email if you want, their details are on the website or their blog. If you are in the USA then there are loads of people who can help you.